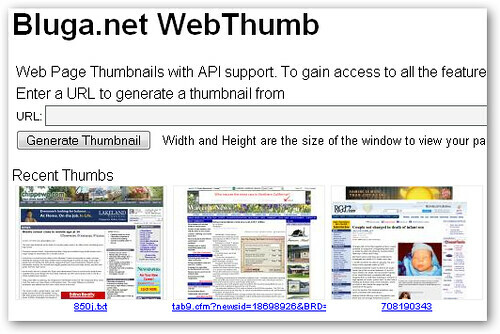 WebThumb is a simple website built on PHP and AJAX that lets you create thumbnail images of web pages. Just enter a URL and select a screen resolution (1024x768, 800x600, 600x480) to generate your thumbnail. A neat feature of the website is that you can view thumbnails in real time as they are created along with details like URLs in queue and number of generated thumbnails updated on-the-fly. All courtesy of some neat AJAX coding.